For the German weightlifter, see Adolf Wagner (weightlifter). For the German economist, see Adolph Wagner. For the Austrian sculptor, see Adolf Wagner von der Mühl. He served in World War I as an officer in the German Army. He lost his right leg below the knee during the war. A member of the Nazi Party from its earliest days, he was appointed a Gauleiter for various districts in Germany, eventually becoming Gauleiter of Gau München-Oberbayern. He was also Bavarian Minister of the Interior and of cultural affairs, and there held absolute authority in his Gau despite nominally reporting to Reichsstatthalter Ritter von Epp. Wagner served as the master of ceremonies for the annual commemorations of the 1923 Beer Hall Putsch every 9 November in Munich. As Bavarian Education Minister, in April 1941 he ordered that school prayer should be replaced by Nazi songs and that crucifixes and religious pictures be removed from Bavarian classrooms, which outraged the Roman Catholic Church and the general public. The opposition to this move was so strong that Wagner was forced to rescind the order, one of the rare circumstances of successful public opposition in Nazi Germany. Despite this faux pas, Hitler apparently remained on good terms with Wagner. When Wagner died in April 1944, two years after suffering a stroke that had effectively incapacitated him, the increasingly reclusive Führer made a rare public appearance to attend his lavish funeral, and posthumously awarded him the German Order, the Nazi Party's highest decoration. Rare 8 mm color film of Wagner appears in home movies (c. 1938) filmed by Hitler's companion, Eva Braun. He can be seen talking with Hitler on the terrace of Hitler's Bavarian residence the Berghof, near Berchtesgaden. Winfried Müller: Gauleiter als Minister. Die Gauleiter Hans Schemm, Adolf Wagner, Paul Giesler und das Bayerische Staatsministerium für Unterricht und Kultus 1933-1945, In: Zeitschrift für Bayerische Landesgeschichte 60, 1997, (973-1021). ^ Winfried Müller: Gauleiter als Minister. Die Gauleiter Hans Schemm, Adolf Wagner, Paul Giesler und das Bayerische Staatsministerium für Unterricht und Kultus 1933-1945, 1997. ^ Richard J. Evans (19 March 2009). The Third Reich at War: 1939-1945. Penguin. p. 483. ISBN 978-1-101-02230-6. Retrieved 13 January 2013. 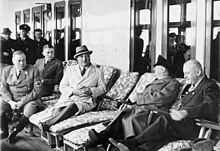 ^ "Eva Braun Home Movies, part 1 Hitler, Nazis in color (Wagner appears at 4:20)". YouTube. Archived from the original on 2 July 2016. Retrieved 8 June 2013. Wikimedia Commons has media related to Adolf Wagner.